Free agency is officially in full stride. All free agents can now negotiate with new teams so some might start signing contracts in the coming days. Don’t look for any of the Kentucky natives to sign until later this offseason though. 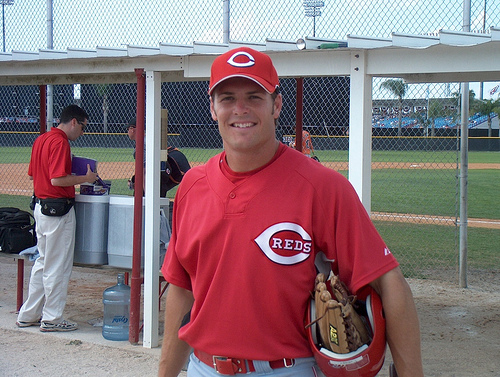 The Reds added 2009 Bats Chris Heisey, Logan Ondrusek, Chris Valaika, Philippe Valiquette and Travis Wood to the 40 man roster. MLB.com’s Mark Sheldon reports 2009 Bat Lance Nix refused assignment to Louisville and became a free agent. Rick Bozich of the Louisville Courier-Journal reports UofL did not recruit White Sox Manager Ozzie Guillen’s son Ozney Guillen despite published reports he signed with South Florida over Louisville. The Bowling Green Daily News reports on WKU’s new baseball signing class. Dan Conolly of The Baltimore Sun reports the Orioles claimed 2009 Bats catcher Craig Tatum off waivers from the Reds. UK alum Joe Blanton finished the season 12-8 with a 4.05 ERA after a loss to the Marlins. 2009 Bat Justin Lehr finished his major league season 5-3 with a 5.37 ERA after a loss to the Pirates. Jason Grey of ESPN.com calls Pikeville-native Mark Reynolds the biggest 2009 fantasy baseball surprise. Ashland-native Brandon Webb was named the most crushing fantasy injury of the season. In the SAL league prospects chat (subscriber only), Baseball America touches of UofL alum B. J. Rosenberg, Legend Ross Seaton and Hot Rod Tim Beckham. The Kansas City Star reports the Royals might look to move original Lexington Legend John Buck this offseason. 23 — Mark Reynolds — Arizona Diamondbacks — Pikeville, Ky.
99 — Dan Uggla — Florida Marlins — Louisville, Ky.
Former Bat Drew Stubbs is living up to his college nickname already in his short stint in the big leagues. Stubbs sent the Cincinnati Reds to victory today with a home run in the 10th inning. The home run was Stubbs’ first in his major league career. Fantasy sports expert Will Carroll also tweeted Thursday that Stubbs was worth a flier for some cheap steals.